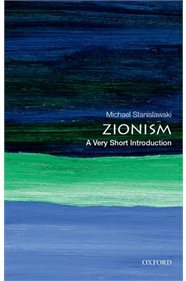 "In this Very Short Introduction, Michael Stanislawski presents an impartial and disinterested history of Zionist ideology from its origins to the present. Sharp and accessible, he charts the crucial moments in the ideological development of Zionism, including the emergence of modern Jewish nationalism in early nineteenth century Europe, the founding of the Zionist movement by Theodor Herzl in 1897, right through to the rise of the aPeace Nowa movement, and the election of conservative prime minister Benjamin Netanyahu. Stanislawski's balanced analysis of these controversial events illuminates why, despite the undeniable success in its goal of creating a Jewish state, profound questions remain today about the long-term viability of Zionist ideology in a rapidly destabilizing Middle East. ABOUT THE SERIES: The Very Short Introductions series from Oxford University Press contains hundreds of titles in almost every subject area. These pocket-sized books are the perfect way to get ahead in a new subject quickly. Our expert authors combine facts, analysis, perspective, new ideas, and enthusiasm to make interesting and challenging topics highly readable."